Motherwell powerhouse Cedric Kipre reveals why his bleached hair look was back for Rangers semi-final! 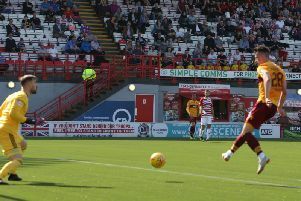 Motherwell defensive powerhouse Cedric Kipre told the Motherwell Times exactly why he was back to sporting his bleached blonde hairstyle in Sunday's 2-0 Betfred Cup semi-final win over Rangers after a recent sabbatical. Kipre (20) revealed that his mum, dad, brother and sister were at Hampden to watch him in action and it was a bit of motherly pressure that persuaded him to dye his hair once again! “I had to dye it again because my mum wanted me to do it,” said the former Leicester City under-23 star. “I did it for her. It’s good that my family came over from France to watch the game. “Hopefully they’ll come back for the final. “I think the supporters were amazing today. “Motherwell have not got to a final in a long time. “Obviously everyone was behind us, it was really good. “I didn’t expect to reach the final so soon after joining the club. I’m very happy and very proud. “Every day we’re working hard in training and we don’t take our foot off the pedal so it’s good, we’re enjoying it. “I thought I had scored today. I don’t think I’m going to score this season, I’m so unlucky.